At a recent party, the participants ranged from two to six years, with most being four and under. When we have a younger crowd, we often adjust our activities to fit their age and attention. In this case we added in a story time with a fun story about Olaf. The children were very engaged and simply loved this interaction. When it was time to sing their favorite Frozen song, they sang along with a lot of gusto as well! Olivia's birthday party was practically perfect in every way. The children could not have been more delightful, and to say we had fun would be a huge understatement. From the time the Snow Queen arrived to the moment she left, the smiles and laughter were continuous. Olivia's mom also did an amazing job decorating, from handmade snowflakes and snowball garlands to a darling "Pin the Nose on the Olaf." Last Sunday at the Cordera Community Center, Zoe celebrated her fifth birthday along with many friends who were quite excited to meet the Snow Queen. We've been busy with quite a few parties. Snow Queen is the current favorite, with Cinderella a close second. We recently enjoyed doing another party at Mountain Grounds Coffee House (3315 W Carefree Cir 719-550-4758). If you're looking for a terrific party venue, check them out. The owner Melinda sets everything up for a lovely tea party, with plenty of room for party activities. Here you can see how the girls love to sing along with the Snow Queen. Most of them know the words to "Let It Go" by heart. Today the Snow Queen visited a seventh birthday party attended by some very sweet young girls and a cute little boy dressed as a kangaroo. The girls simply loved her, and very enthusiastically sang along with "Let It Go" as well as participated quite energetically in all the dancing and games. As much as they loved the games, their favorite time seemed to be when each girl got their own makeup session with the Snow Queen. They were so excited that they all gathered around, which gave Snow Queen the opportunity to have some fun conversation with these sweet girls in a more intimate setting. It was hard to bid farewell to this group, and there were lots of warm hugs! Cinderella visited Myra's fourth birthday today held at the Milibo Art Theatre (www.themat.org), which is located on S. Tejon in the Ivywild neighborhood. The MAT is a treasure of our community and offers shows for people of all ages as well as dynamic theatre and circus classes. Actress and founder Birgitta De Pree hosted the party as "Miss Burrito," and her presence made this party and our interactive games all the more fun. Snow Queen is Simply Fun! Here is Snow Queen at a fifth birthday party in December (see previous post). These photo give a little peek into the fun interaction between children and this popular character. Through well-planned games and activities, she is great at getting children engaged and interacting with her and each other. For the "glamour" portion of this party, the girls were so thrilled to get some one-on-one time getting their makeup done, and their delight shows in these photos. 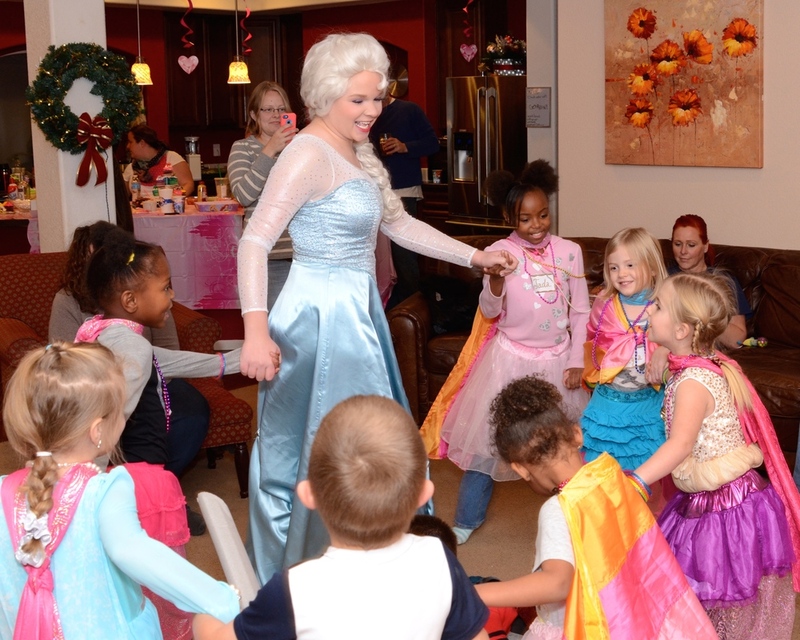 The second Saturday in December was THE day for princess parties...and to accommodate the many requests, we actually scheduled three events in one day. With lots of planning and preparation, we pulled it off successfully. And at the end of the day...boy, were we tired! The princess herself got organized for makeup/hair prep and even taped inspiration photos and a schedule to her mirror. Besides the princess herself, the key was having everything ready to grab and go for each event, including camera, batteries, iPhone w/playlists, portable speakers, treasure box, dress-up trunk, and most importantly, our party bag filled with all our gear including makeup, crafts supplies and the certificate, tiaras and wand for each coronation. Yes, we are detail-oriented! With good planning and prep, the day itself went fairly smoothly. We first attended the pancake breakfast for a meet-and-greet with Cinderella Scholarship Pageant participants (previous post). On the way back, we stopped for a treat. This behind-the-scenes photo shows modern Cinderella with her iPhone and Starbucks! After a lunch break, it was a fourth birthday party with a darling birthday girl dressed just like Cinderella. Her Grandma held this event at her specialty chocolates business, with themed decor and gourmet treats. After this party we had less than an hour to transform Cinderella into Snow Queen. She quickly altered her makeup to include purple eyeshadow and pinned her hair flat to put on the wig. After braiding the wig, inserting sparkly snowflake pins, zipping the dress and attaching her long cape, we drove to Fountain for the last party of the day. We'll do a separate blog post on that one, but it went well. While we were truly tired driving back, we felt a sense of satisfaction in the many happy smiles and warm hugs of the day. We offer not only birthday party entertainment but also appear at special events. Recently, Cinderella attended a pancake breakfast for local Cinderella Scholarship Pageant participants (www.ColoradoCinderella.com). This is a natural pageant where participants learn how to model, interview and develop talent, ultimately to increase their confidence. The young ladies at the breakfast were delighted to meet Cinderella. The first one to hug her held on for some time, and it was truly precious. Each girl had a chance to meet Cinderella, talk with her, and received a candy treat. They were so patient to wait their turns, and their smiles and personalities left smiles on our faces as well. If you're wondering whether to invite boys to a princess party, the boys at a recent Snow Queen party for Esther's sixth birthday would unanimously vote, "Yes!" Half the participants were boys, and this was for a premium party, which includes everything in our basic party plus dress-up, make-up, craft and a coronation. With the exception of make-up (which occasionally a little boy may want applied), all of our activities are fun for both boys and girls. Princess training includes prince training as well, where boys learn to bow and introduce themselves, and everyone loves to dance, wave and twirl. For dress-up, we have princely attire including vests, sashes, scarves (even one with flames! ), breastplates, medals, necklaces and capes. Nearly all the boys had quite a bit of fun picking out which pieces to wear. One boy wore everything...a vest, a cape, two sashes, a scarf, five medals, and several necklaces. Of course the girls love the sparkly and twirly skirts, colorful scarves, pink tiaras, necklaces, bracelets and capes as well. Because we apply make-up while everyone is doing their craft, the boys aren't left out. Everyone loves making their own necklaces to keep and wear, and there are plenty of beads in all colors, shapes and sizes...even animal beads. Many people ask about the best age to do a princess party. We usually recommend ages 3-8, although occasionally do parties for younger princesses who have older party guests. Such was the case for Eva, a darling two-year-old who celebrated today with her "big" girlfriends dressed up as familiar princesses. Eva was pretty excited when Cinderella walked in the door for her princess party. Eva is so darling. She must be intelligent, because she is so inquisitive. She wanted to see how the music machine worked, how the camera worked, and touch anything that looked interesting. She played some games and was also content to watch her friends play with Cinderella. Eva's mom decorated so beautifully and was dressed in royal attire herself; we love to see moms dress up too! Eva's girlfriends loved the interactive games, especially the magic wand game, which engages young imaginations, as well as the usual favorite, "Ring Around the Princess." You can see from the first photo how Cinderella engages party princesses with well-planned, interactive games. Eva's party was the first where we presented one of our pretty rhinestone tiaras, available as an upgrade to any coronation. You can see how cute it is in this photo of Cinderella with the birthday girl. What a cutie. Princess rhinestone tiaras have arrived! After 35 days in transit, we just received our newest rhinestone tiaras. You can upgrade any coronation to include this tiara for only $10. These are really cute and fit like a headband, so they stay on little heads. The princess coronation adds a special touch to any party. The princess character gathers all the participants around her and presents each guest with a mini tiara (girls) or coin (boys). Then she reads a special "princess" proclamation and presents the birthday girl with a full-size tiara, princess wand and certificate. Along with the party guests, the princess sings "Happy Birthday." The princess coronation brings the spotlight to the birthday girl and adds a special touch to her princess party. Read more about party packages that include the coronation on our Packages page. One of the most time-consuming parts of character development is wig styling. The Snow Queen wig has been the most challenging to date. First we ordered a blonde wig that clashed terribly with the white sparkly fabric of her dress. So after many hours of research, we found a post by a cosplayer (a cosplayer is a person who develops character costumes as a hobby and typically attends cosplay conventions) who had purchased a silver wig (mostly white, actually) and tea-dyed it. So that's what we did; purchased an Arda lace-front wig (Tauriel in silver) and tea-dyed in a large stock pot using lots of tea bags. We used the most golden tea color that we had on hand (can't remember the flavor, but it was a warm honey brown color in the pot). The tea-dying gave the wig a warm, slightly golden white blonde color that works perfectly with the dress. Our original style was teased at the top to build volume, braided to the side, and embellished with rhinestone snowflake buttons wired into the braid. This original style worked well for many parties, but had to be re-combed and braided for each party because the braid got a little ratty on the underneath side. We were never completely satisfied with this original style, so this past week decided to restyle the wig. This turned out to be quite the project. After watching several YouTube videos on different braiding techniques, we realized that the wig needed to be curled to create more volume. Curling a thick wig of this length is no easy task; you can't roll it all at once because all the curlers won't fit. So, working from the bottom up, we detangled and flat-ironed and combed and rolled about the bottom third of the wig, keeping the other hair clipped away. We had to experiment with several sizes of curlers to get the right curl; we ended up with 7/8" snap-on plastic rollers. We could only roll about two wefts at at time about 2" wide; otherwise the hair would be too thick to snap on the roller cover. We ended up sticking plastic picks through the rollers to hold them in place on the styrofoam wig head because some of the snap-on covers came off. After rolling one section, we heated each roller with a hair dryer and then allowed to cool; this is how to curl a heat-resistant wig (Arda wigs has several tutorials). After unrolling the first section and being satisfied with the outcome, the trick was how to roll the next section and heat without relaxing the curls in the first section. To accomplish this, we put the first curled section in a plastic grocery bag and pinned the bag to the wig form, basically covering it completely but leaving the uncurled hair exposed. Then we rolled the next section; when we heated it, we used a piece of cardboard cut with a curve to fit the wig form as a shield to keep the heat away from the hair in the plastic bag. This worked fairly well. So, after many tedious hours, here's the curled wig. It's not restyled yet, but we intend to basically put it in a loose side braid for a pretty, windswept look that is much fuller than the original style. The amount of love and preparation put in by Isla's mom and grandma for her fifth birthday Mermaid Princess party was amazing. And Isla and her friends were simply so much fun. From the get-go, they literally laughed and screamed with delight, especially during game time. We played dress-up with sparkly princess skirts, capes and scarves, necklaces, earrings (oops, they kept falling off! ), tiaras & bracelets. We freeze danced, played the "magic wand" game, and, the favorite game, "Ring Around the Mermaid." After the birthday princess coronation, we took keepsake photos in the fabulous Mermaid Princess chair made by Isla's grandmother.